The joyous harmony of people coming together from so many different nations for World Youth Day stands in sharp contrast to today’s “sad” situation of confrontational nationalist feelings, Pope Francis said. Source: CNS. 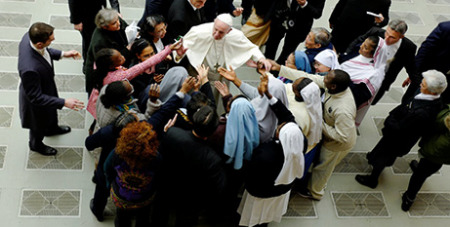 “It is a sign that young Christians are the leaven for peace in the world,” he said at his general audience yesterday in the Vatican’s Paul VI hall. The Pope dedicated his weekly reflection to his January 23-27 trip to Panama to celebrate World Youth Day.